The Oud S Table Lamp is one of the many fine eco-design products from Bellila that are made in France. 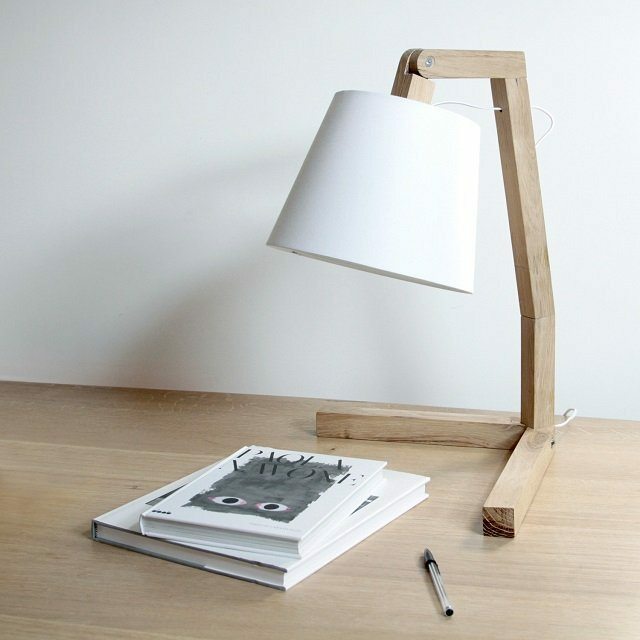 It’s a simple and minimalist lamp with a wooden frame that looks like a stick figure. It’s delivered to you flat, and you can quickly assemble it into a standing table lamp with a lamp shade at the end of a hinged piece of wood. The lamp is an eco-friendly product made of solid oak from sustainably managed forests in France. The lampshade is made of cotton, and the lamp comes with a black wire and switch, and an optional dimmer if you need one. If you like this, they have many more such quaint lamps including the Cuboid Lamp and the Tamago Lamp.